A type of fruit that may grow as large as a foot in diameter and is the largest citrus fruit. It is closely related to the grapefruit, but it is a bit less juicy, less bitter, and is sweeter. A Shaddock has a very thick skin that ranges in color from green to yellow. The skin covers a thick pithy area that is followed by the firm pulp. The pulp is a yellow color in the green skin variety and a pink or rose color in the yellow skin variety. The pink and rose-colored pulp is slightly sweeter than the yellow pulp. The Shaddock is native to Southeast Asia, but is also grown in Caribbean countries and in subtropical areas of the United States. Shaddocks are available in well-stocked supermarkets and specialty markets and should be stored in the refrigerator to prolong freshness. 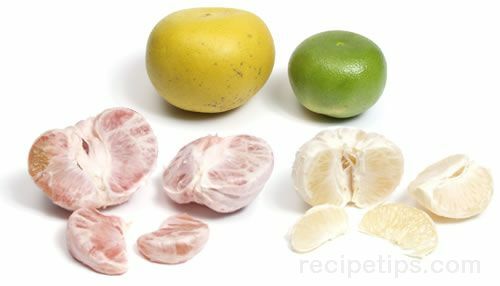 A Shaddock is more popularly known as a pummelo and may also be called a pomelo, pommelo, Bali lemon, Limau besar, pamplemousse, and Chinese grapefruit.